Today is, as is any February 14th is, Valentines Day. We are not here to encourage celebrating it or not. 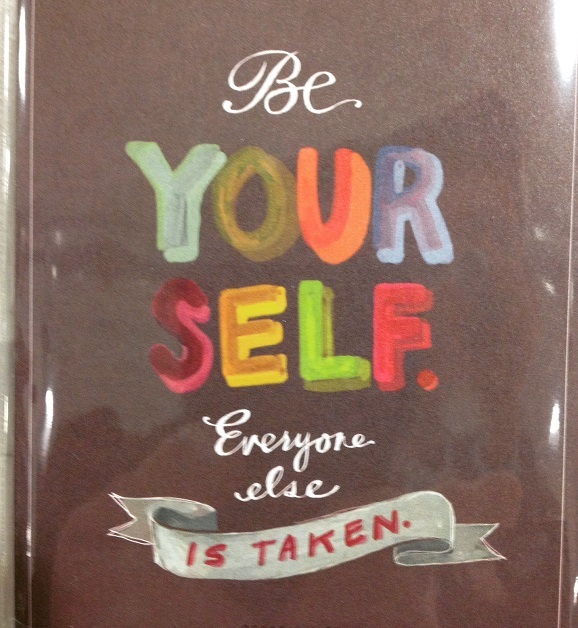 We just wanted to say Be Yourself On This Day and Everyday. In case you didn’t know this is the origin of Valentines Day. Taken from Wikipedia: “St. Valentine’s Day began as a liturgical celebration of one or more early Christian saints named Valentinus. Several martyrdom stories were invented for the various Valentines that belonged to February 14, and added to later martyrologies. A popular hagiographical account of Saint Valentine of Rome states that he was imprisoned for performing weddings for soldiers who were forbidden to marry and for ministering to Christians, who were persecuted under the Roman Empire. According to legend, during his imprisonment, he healed the daughter of his jailer, Asterius. An embellishment to this story states that before his execution he wrote her a letter signed “Your Valentine” as a farewell. Today, Saint Valentine’s Day is an official feast day in the Anglican Communion, as well as in the Lutheran Church. The Eastern Orthodox Church also celebrates Saint Valentine’s Day, albeit on July 6 and July 30, the former date in honor of the Roman presbyter Saint Valentine, and the latter date in honor of Hieromartyr Valentine, the Bishop of Interamna (modern Terni). In Brazil, the Dia de São Valentim is recognized on June 12″ (view excerpt here). February 14th was first associated with romantic love in the circle of Geoffrey Chaucer in the High Middle Ages, when the tradition of courtly love flourished. Be Yourself – Everyone Else Is Taken – Be Happy with Who You are – There Is Only One Of You In the Whole World – and Remember, You are with Someone Not Because You Need Them or They Need You – You are Together Because You Want To Be – Happiness Depends On You. But just in case your looking for a splendid recipe check these out: Salads as a Main Course . On this day of hearts, our food is heart healthy, and that should matter, because your heart and your sweetheart’s heart will still be with you both after this day passes. Will the Real St.Valentine Please Stand Up? This entry was posted in Uncategorized and tagged Alexandria, Anatolia, Andrey Zvyagintsev, Anglican Communion, Eastern Orthodox Church, origin of Valentines Day, Russia, Saint Valentine, Saint Valentine of Rome states, Saint Valentine's Day, Valentine's Day. Bookmark the permalink.